Uplifting Love: Loving Acts Say "I Love You"
According to an article I read in the Wall Street Journal today saying "I love you" through your deeds leads to greater satisfaction in marriage and relationships. I believe we all know this is true. The article reports on a study conducted by Dr. Harry T. Reis, a professor pyschology at the University of Rochester, of 175 newlywed couples since 2009. The findings thus far indicate that couples who regularly come up with ways to show their spouses they are loved have happier marriages. 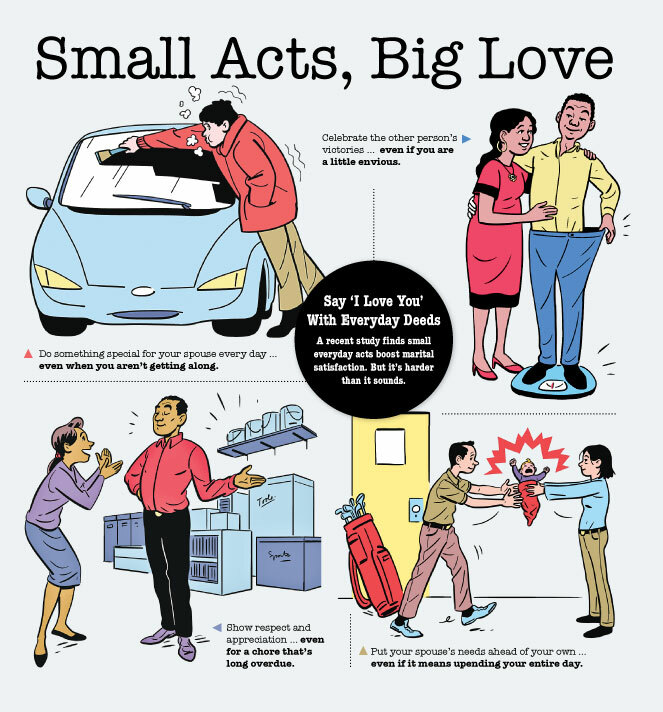 The article shares stories from subjects in the study, suggestions on how to show your spouse you love them, and concludes with the suggestion to give being kind a try. The graphic below is taken from the article and is a good reminder of how small and simple gestures help develop "big love." (I talk about this in a prior post as well, check it out). I agree with Dr. Reis' findings; it is important to show your love. I also want to stress that it is just as important to tell others that you love them too. Do both and you will be surprised how quickly your love with grow and uplift your relationship. With Valentine's Day tomorrow I challenge you to share your love with your spouse both in word and in deed (then tell me about it! )﻿.